THE 2015 UK Parliamentary General Election is fast approaching and the only way you can have your say is to be on the electoral register. 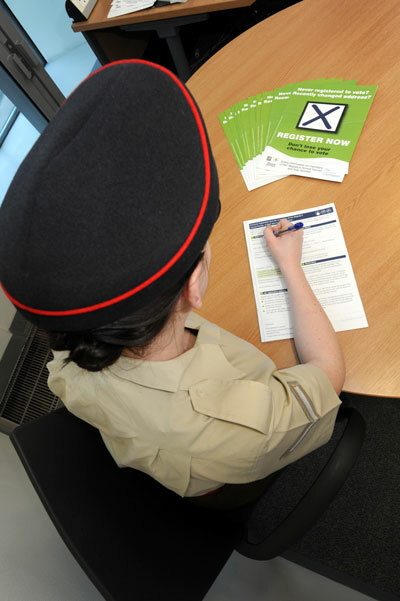 You and your soldier can also register as Service voters allowing you to be registered for five years at a fixed address in England, Scotland or Wales even if you move around. This is particularly handy if you’re already based overseas or think that you may be posted abroad soon. Go to www.gov.uk/register-to-vote/armed-forces to sign up. By post – if you want your ballot paper sent to you, then you need to consider whether there is enough time to receive your postal vote, complete and returning it so that it arrives by 10pm on polling day. Postal votes that arrive after this time will not be counted. By proxy – ask someone you know and trust to vote on your behalf. The proxy can either vote for you at your polling station or by post. In person – this option applies if you are able to go to the polling station where you are registered to vote on polling day. If you have appointed a proxy, you can still vote in person on polling day as long as the proxy has not already voted for you or applied to vote for you by post. Your vote matters – make sure you’re in!